While we do update the Cats Available section as new cats come in or are adopted, to the casual visitor it may appear as if the website has not had any recent activity. Scroll down here and follow us on Facebook and Twitter for regular news and updates. Rocky Mountain Siamese Rescue is an all-volunteer 501c3 non-profit organization dedicated to helping as many Siamese and Siamese-mix cats as we can. We are based in Colorado, but it is our intention to serve the West and Midwest. 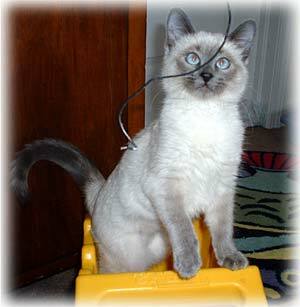 We first became involved in rescue with the Virginia Siamese Cat Rescue Center (VASRC) in early 1998. Our Executive Directors also served on the VASRC Board of Directors from 1999-2001; served as Transport Directors for the Meezer Express from 1999-2002; fostered for Kansas Siamese Rescue for several years before its closing in 2004; and worked with other Colorado volunteers as a chapter of California Siamese Rescue from 2003-2004 before forming our own organization in 2004. We enjoy great working relationships with local shelters and other rescue groups. We do not currently have a rescue building, so we operate with a network of foster homes. We are constantly getting telephone calls from individuals, local shelters, rescue groups and animal hospitals to save Siamese, so our most immediate need is more foster homes and resources toward building our own facility. As you may imagine, it takes endless amounts of time, money and help from volunteers to keep a rescue running so we can continue to help the cats. Your donations of time, funds and goods are always needed and welcome. We have many different volunteer opportunities to fit your talents and availability. If you would like to donate something but are not sure what we may need, please feel free to check out our Wish List or just contact us directly. We keep our Wish List updated with our most current needs. We also ask that you spread the word about our organization to your friends and family. We are always in need of volunteers and supporters to help our important cause. Thanks for visiting our site, and for caring enough to make a difference!